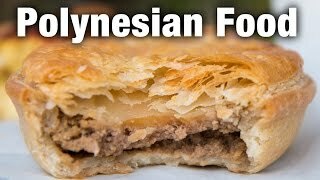 When I was in Hawaii, on the same day as learning how to cook a pig in an imu, kind of a cross between and Hawaiian and Samoan version, I also had a chance to walk around the Polynesian Cultural Center and eat some of the main snacks they offered in what they call the Taste of Polynesia. The Polynesian Cultural Center is a center that aims to preserve the cultures of the main islands of Polynesia. The center is set up in villages, where there are traditional homes, and a series of performances from the country represented. To make things more well rounded, the Taste of Polynesia is basically a series of small snack bars that open and each serve a different set of Polynesian food snacks. We started in the village of Samoa with sausage and gravy over rice, a dish I never would have thought is so popular in Samoa. But due to the British influence I believe, it’s quite a popular dish. The sausage was simmered in gravy, and paired with rice. The sausage was actually quite good, a little plain, but very good. Also in the Samoa village, we tried a panipopo, basically a bun that was slightly sweetened, and covered in a thick coconut cream sauce. I’m not a big desserts eater, but this was alright. The bun was nice and fluffy like a roll, and then the sauce was thick and creamy. Lastly in the village of Samoa at the Polynesian Cultural Center we tried the half-Moon pineapple pie, basically a pastry filled with pineapple insides. Moving on, we continued our Polynesian food tour in Tonga with a dessert snack called ‘Otai. ‘Otai was more of a beverage with fruit. This one was too sweet for me, but it was good if you enjoy sweets and need something cool on a hot day walking around. Next up from native Hawaii, they served a dish called koelepalau, purple sweet potato coconut pudding. This one was probably my wife’s favorite. It tasted like sweet potatoes, mashed, and mixed with rich coconut cream. It wasn’t too rich or sweet, but had a nice fragrance, and it was quite good. Although this is a Hawaiian dessert, it’s not too easy to find in Hawaii. Of all the desserts we ate at the Polynesian Cultural Center, my favorite was the po’e, from Tahiti, a banana cake topped with coconut cream. The bananas were a little overripe (on purpose), almost to the point where they were slightly candied and just before that fermentation taste. Then they were covered in coconut cream that wasn’t sweetened at all. They informed us that there was not sugar in the recipe, just really sweet bananas and coconut milk. It was pretty good, and naturally sweet, and a good contrast of flavors. Over in Fiji I was ready to eat the Fijian chicken curry. I didn’t know Fiji had such a big Indian influence, and so I was happy to finally see a dish that had some good flavor to it. The spices in the curry were mild, yet well balanced, and the Fijian curry was my favorite dish of the tour. After the curry, I tried a meat pie from Aotearoa (New Zealand). I don’t have too much experience in the meat pie department, but this one was pretty good, filled with meat and cheese. Finally, the last thing I ate at the Polynesian Cultural Center was an egg, bacon & cheese quiche, also from Aotearoa (New Zealand). NOTE: I was invited to come to the Polynesian Cultural Center when I was in Hawaii, so I didn’t pay for the food or the entrance ticket. But I’m not affiliated with the center, and all thoughts and opinions in this video are my own.